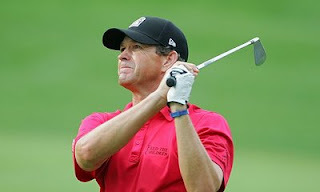 4U Management client, Lee Janzen finishes strong posting a 67 today and winning $186,150 at the RBC Canadian Open. Lee Janzen fired an opening round 68 in today in the rain delayed Canadian Open. SILVIS, Ill. (AP) -- The stark reminder is right there on Lee Janzen's cell phone, a grizzly picture that makes him wince and reminds him how far he has come. His old swing, actually, the one that made him a non-factor. "I think confidence is your most valuable club in your bag," Janzen said. He just got a big boost. Janzen stirred some memories with a 7-under 64 that left him tied with Darron Stiles for the lead after the first round of the John Deere Classic on Thursday. Janzen has not won on the PGA TOUR since he captured his second U.S. Open in 1998, yet he's in position after an impressive start at TPC Deere Run. The 44-year-old was at 8 under after birdies on 16 and 17 but he had his first bogey on No. 18 when he hit into a bunker and missed an 8-foot par putt. He was off the course by the time Stiles made a 7-foot birdie putt on the same hole to forge the tie. J.J. Henry, Matt Bettencourt and Dean Wilson were one stroke off the lead. Last year's winner Kenny Perry, who is second in FedExCup points, opened with a 68, while U.S. Open champion Lucas Glover and Zach Johnson shot 69. It was not a good day for David Duval, who finished with a 75 and was in danger of missing the cut after a surprising three-way tie for second at the U.S. Open last month. This time, Janzen was the veteran turning heads. "It'd be exciting; I would love to win," Janzen said. "If it doesn't happen this week, I still think that I'm capable of winning, and it won't stop me from continuing to work on my game to get better." An eight-time winner on the PGA TOUR, Janzen has two top-10 finishes the past three years. He's spent much of that time trying to repair his swing with coach Mike Bender after leaving Butch Harmon. "I'm still hitting right-handed," Janzen said. That's about the only similarity. "I never had a struggle or challenge like I've gone through the last few years," Janzen said. "So you know, garbage in, garbage out. I've got to undo a lot of bad stuff over the last few years on top of rebuilding my swing." The results have been slow to come. One good sign for Janzen came in April at the Verizon Heritage in Hilton Head Island, when he opened with a 6-under 65 and finished in a tie for fourth. He got another boost on Thursday, when he made a late push to grab the lead. He was 4 under through 12 when he birdied four of the next five holes. His 7-foot birdie putt on the par-5 17th put him at 8 under before his mishaps on the final hole. That created an opportunity for Stiles, the Nationwide Tour's career money leader, and he two-putted from 3 feet for a bogey on 17 before making up for it on the final hole. "I'm going to look at that as opposed to the bogey on 17, take the birdie into (the second round) and keep that positive momentum going," he said. The same goes for Janzen, who also cautioned: "It's only Thursday." So he'll wait before he declares himself back. "It's like starting over in some ways," Janzen said. Duval would probably like to call a do-over after this round. Winless since the 2001 British Open, he simply was sluggish in his first start since that eye-opening performance at Bethpage Black. "I don't equate it to how I did at the U.S. Open," he said. "That has no relevance, no bearing on what I'm doing here. I just didn't play that well." The world's No. 1 player before a long decline, he was even after making a 9-foot birdie putt on the par-4 8th, but four straight bogeys quickly brought his momentum to a halt. "I just wasn't as sharp mentally today," said Duval, who was also tired and concerned he was coming down with something. "Why? I don't know. I just wasn't. I didn't think as clearly as I would like to. I made a couple of bad decisions that cost me." 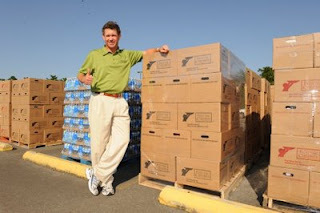 Lee Janzen attends a food drop with Feed The Children during the 2009 Zurich Classic in New Orleans.